With the high number of large sensor camera releases at NAB, we wanted to get an expert opinion on how to choose the right lenses from Zeiss’ Richard Schleuning. With such an expensive and necessary investment, Richard’s advice is invaluable to anyone looking to choose a proper lens for any camera. Schleuning started by making the excellent point that Zeiss lenses were made to be future proof, a difficult task in today’s digital camera age, as the technology advances and changes so quickly. He pointed to their 15-30 Compact Zoom on display with the RED Epic Dragon 6K camera as an example of one of their older lenses still capable of covering such a large sensor. This was somewhat of a gambit for Zeiss in years past as, according to Schleuning, creating lenses with such capability originally didn’t make much sense years before the cameras to match the lens power were released. Beyond being full frame, the Compact Zooms are also parafocal and have interchangeable mounts, allowing for even more versatility. All of this points to Zeiss’ attempts to make sure their lenses don’t become obsolete within a few years of release. Educating their customers about how to choose the right lens for a production is key to Zeiss, and this goes beyond the technical aspects of the process. Schleuning makes sure to point out the economics of the situation as well. “Zooms are really rental products”, says Schleuning. “I think maybe for someone who’s getting into the business for the first time budgets are limited of course. But you still need a good zoom. And you can rent a zoom because you can’t justify buying it. And a lot of productions are done that way”. He continues by pointing out that there is a time to buy high priced lenses, especially when the cost may end up being cheaper then the cost of a long term rental. This turns the lens into an investment, one which some people find creative ways to recoup the cost. “You have a lot of guys who invest and then sub-lease it to a rental house and they kind of recoup their investment that way too. So price is relative”. Lens choice and price tag can also lead you to the pitfall of choosing the wrong lens. Schleuning points out that yes, you could purchase a cheaper full frame photo lens and use it with a motion capture camera and have it work. “The question is ‘If I’m zooming and I want to hold focus, does it really hold focus?’ And at that point you really need a true cine style lens to do that”. The technicality of lens choice is also tempered by perception and the image you wish to project. As Schleuning points out, as your skills increase along with budgets and the expectations of you and your work, it becomes more and more important to invest in gear that matches those higher levels of production. We made sure to congratulate Zeiss on a rather esoteric feat, as many films that won awards for cinematography utilized Zeiss Ultra Primes. Schleuning humbly pointed to their upcoming 125th anniversary of the Zeiss camera lens division, citing that people look for a name they can trust. 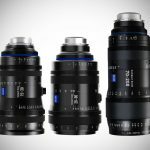 This is obviously due to Zeiss’ high level of craftsmanship and dedication to their craft, as well as dedication to making sure filmmakers of all kinds are able to express their art using the best tools available. On a side note, Schleuning also gave us an update on their exciting Servo Lens Controller that was merely an unworking prototype at last year’s NAB. A move to enter the more ENG/broadcast level of shooting, the Servo Controller will work with Zeiss’ three compact zooms. It will be powered by the camera itself, and snaps quickly on and off the lenses. It lets you control iris, zoom and focus with the one controller. A working unit will be on display at IBC 2015, with a ship date in late 2015. As mentioned earlier, Zeiss’ 125 anniversary of their camera lens division is this year. So Zeiss is offering a warranty extension of one year on all ZEISS Compact Prime CP.2 and ZEISS Compact Zoom CZ.2 cine lensesfor up to 125 days after purchase until June 30th. After that, you will have a four week period to receive the extension. At booth C9543 at the 2015 NAB Show from 13-16 April in Las Vegas, the world’s largest show for the movie and broadcast industries, ZEISS will showcase its entire lens portfolio: from the SLR lenses including the ZEISS Otus high-end lenses, the ZEISS Loxia E-mount full-frame lenses and ZEISS Compact Prime CP.2 and ZEISS Compact Zoom CZ.2 right up to ARRI/ZEISS Ultra Prime, ARRI/ZEISS Master Prime and ARRI/ZEISS Master Anamorphic. Effective from the start of the NAB Exhibition on 13 April 2015, it will be possible to register not only camera lenses, but also ZEISS Compact Prime CP.2 and ZEISS Compact Zoom CZ.2 cine lenses online and therefore receive an extended warranty for an additional year. After online registration on the ZEISS website, a warranty extension of one additional year is then possible for end-customers of ZEISS cine lenses. Effective 13 April 2015, this offer is also available for the ZEISS Compact Prime CP.2 and ZEISS Compact Zoom CZ.2 cine lenses. To mark the 125th anniversary of ZEISS camera lenses, the online registration of ZEISS cine lenses is possible up to 125 days after purchase. This offer will be end on 30 June 2015. After this period, registration will be required within four weeks of purchase in order to receive the one-year warranty extension. The extended warranty from ZEISS is available in a large number of countries, but warranty claims can only be asserted in the country in which the product was purchased. You can find further information and the registration for the ZEISS cine lenses from 13 April 2015 on the website www.zeiss.com/cine/register. 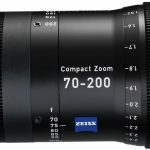 With the lenses ZEISS Compact Zoom CZ.2 15-30/T2.9, the CZ.2 28-80/T2.9 and the CZ.2 70-200/T2.9, ZEISS has set new performance standards for cine zooms. Equipped with an interchangeable mount system (IMS), the lenses can be flexibly used on practically all current and future cameras. The zooms are equally suitable for HDSLR cameras and professional HD video and movie cameras. All lenses of the ZEISS Compact Zoom family comply with the 4K production standards and, like the ZEISS Compact Prime CP.2 lenses, they are ideal for cameras featuring sensors with surfaces measuring up to 36×24 mm. The lenses easily cover image circle diameters of up to 43 mm and function perfectly with sensors such as the RED DRAGON® with an image circle diameter of approx. 34 mm. Many of the lenses exhibited at the booth can be tried out directly on current cameras. Visitors are welcome to ask questions to the ZEISS experts at the booth and exchange their experiences with them.